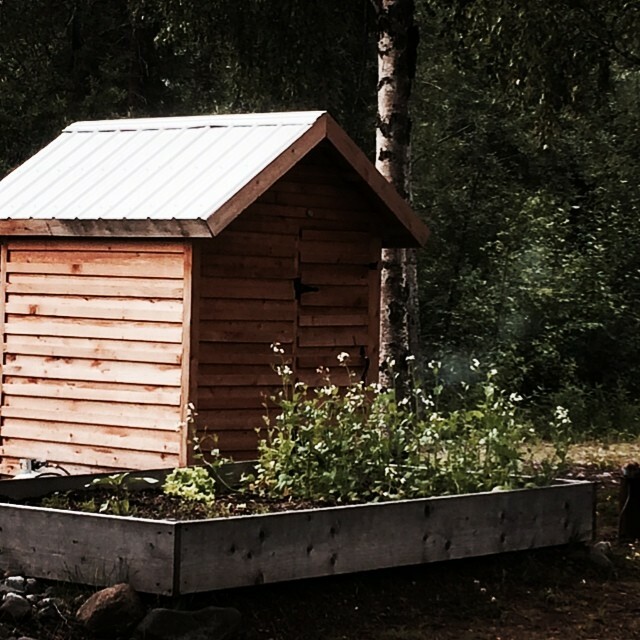 After about a month of evenings and weekends working in the bright daylight in the land of the midnight sun, our walk in smoke house is finished at the Fort. 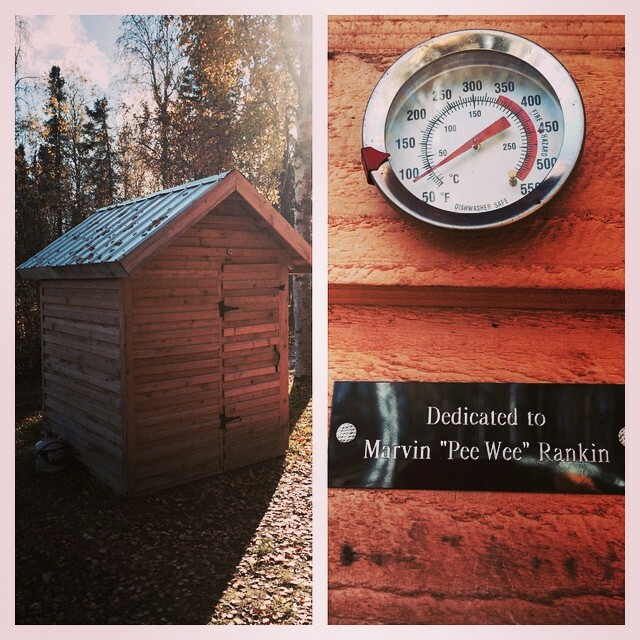 We had planned on building our smokehouse for over a year since seeing our friend, Marvin “PeeWee” Rankin’s. I knew right from the start that he and I and my son Tyler, could build one similar to his. We decided on making it six feet by six feet. Much bigger than that any we could have problems with the smoking effect. Our first step was to lay the foundation. We used the same design as our greenhouse by using railroad ties cut to fit, sunk into the ground and squared. The walls and the room went up next. 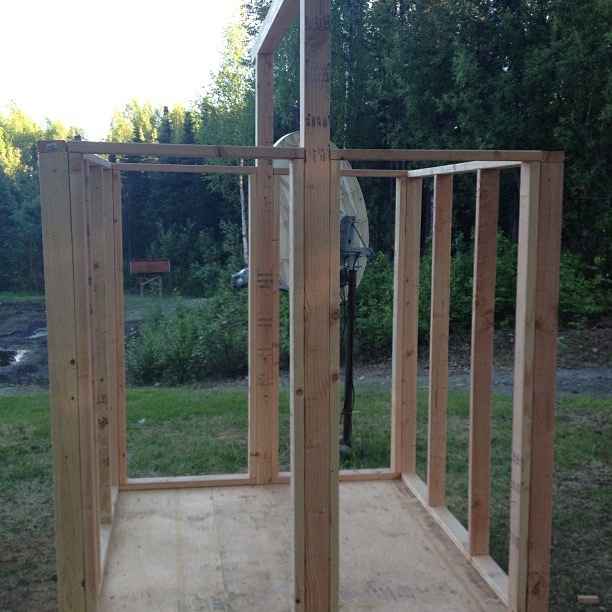 We built it in a typical construction fashion using studs on two foot centers. We laid 3/4 in plywood for the floor and skinned the inside walls with plywood as well. Here are a few photos of the foundation and the shell of the smoke house. 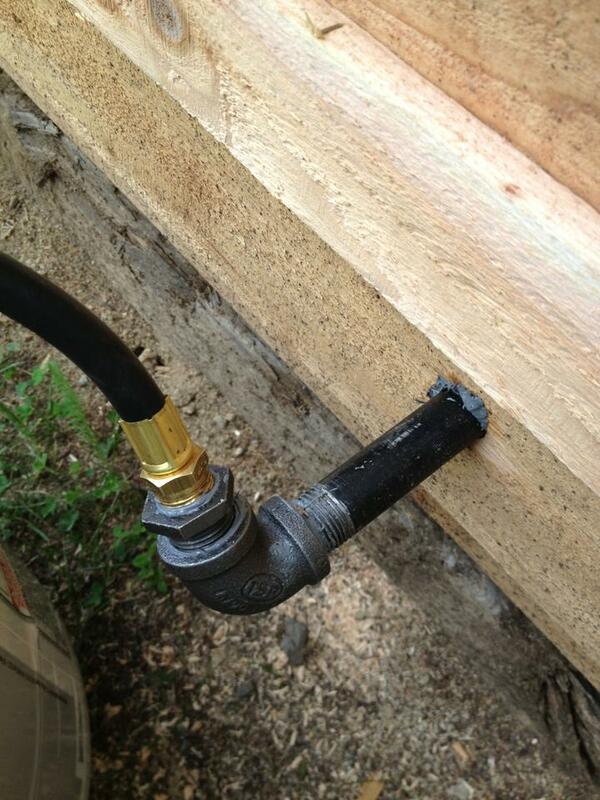 Our initial plan was to side the walls with rough cut pine from a local saw mill but after several unreturned calls we decided on using 5/8″ thick by 5 1/2″ wide cedar slats, similar to what you may use for fencing. We picked them up at Home Depot for about $2.70 a piece and used about a 120 of them. Since cedar will shrink we used the siding boards ripped in half over each seam to give it a much tighter fit and a very good looking exterior. Our initial plan was to lay down red roofing that matched the barn and the trim on the house but found out that it would take almost 5 weeks to order and was very expensive. 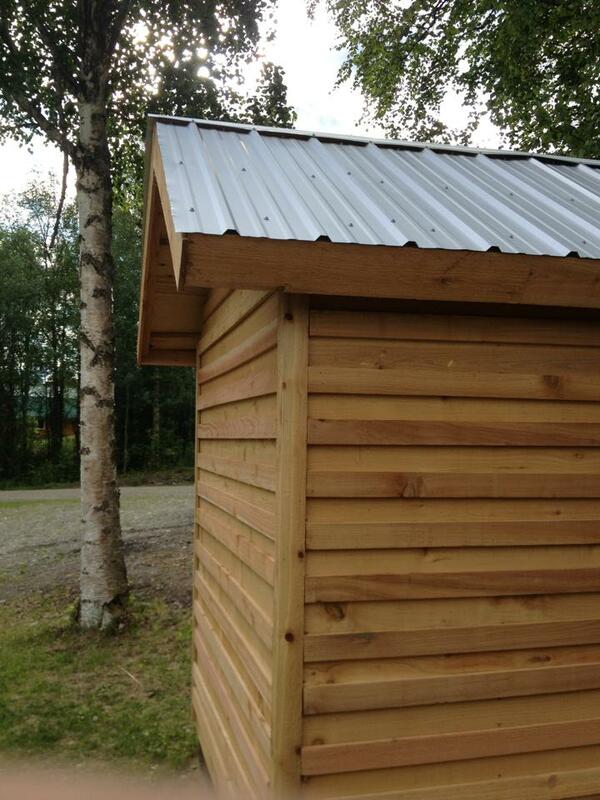 We thought about shingles and decided against and eventually went with steel (non-colored) panels. With the outside complete it was now time to work on the guts of the smoke house. We knew the interior of the structure would be not only the most expensive part of the project but one that would take the most careful planning. Early in the project my wife, Michele, called the local metal company to order stainless steel expanded metal that was to be cut to fit for a quoted price of about $250.00 for 16 racks. When it came time to order they said it would be three weeks and over $500.00! We called every metal company in Alaska and no one carried stainless. We found a company in North Carolina but it would cost over three hundred dollars in shipping. You never want to use galvanized metal in cooking, nor can you use racks from an old refrigerator. They contain metals that are toxic. I drove down to Anchorage on a quest to find racks and I did. I found 12 grill racks at Fred Meyers that were buy one get one half off, and 16 jerky rack trays and four pretty good sized aluminum racks at Sportsman’s Warehouse. We spent the evening carefully installing the racks for maximum use of space and smoking ability. We decided to use the same system that our friend used to fuel the smoker. 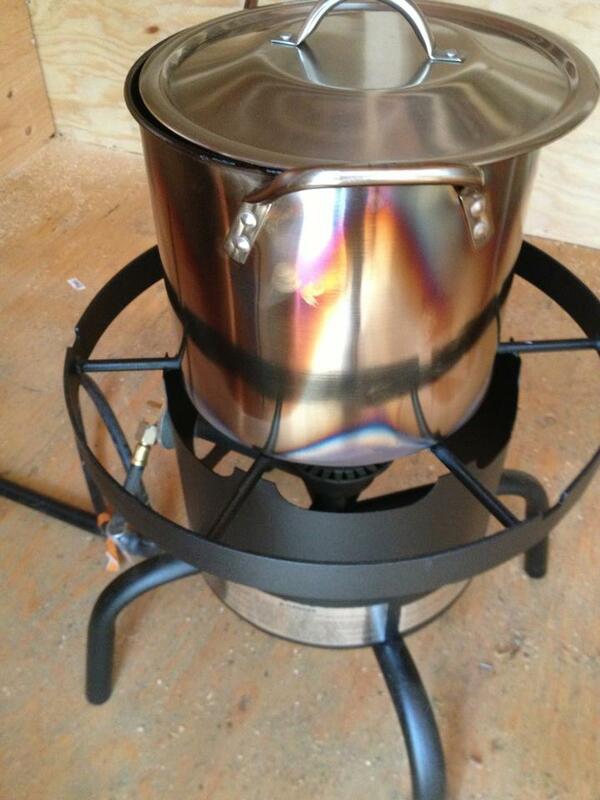 We found a heavy duty propane cooker, similar to a turkey fryer but one without a timer. 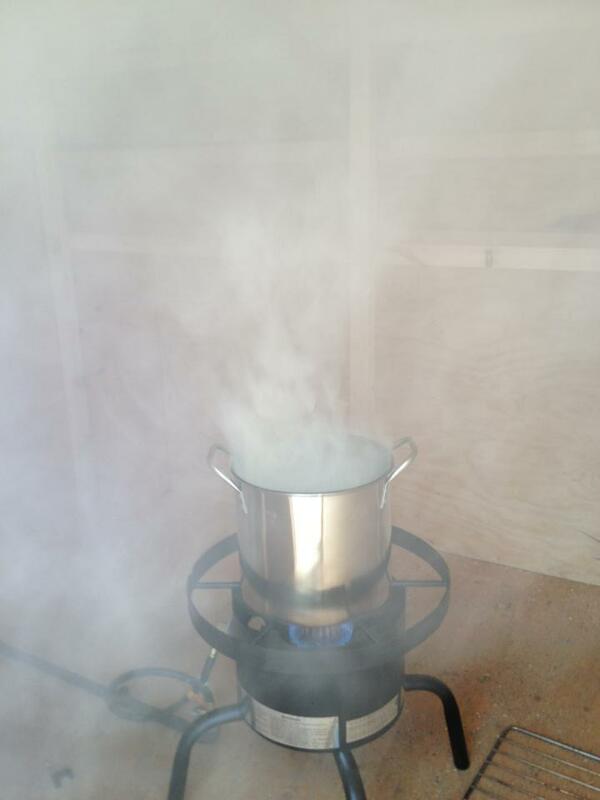 We plumbed in the cooker to a tank outside and fired it up. In our smoke house we are using pellets in different wood varieties that each have its own flavor: hickory, apple, mesquite. A couple handfuls on a low flame inside a steel pot will last an hour and a half or so and produce the desired smoke at the right temperature. We seasoned the smoke house by running it through a couple cycles of pellets three or four times. 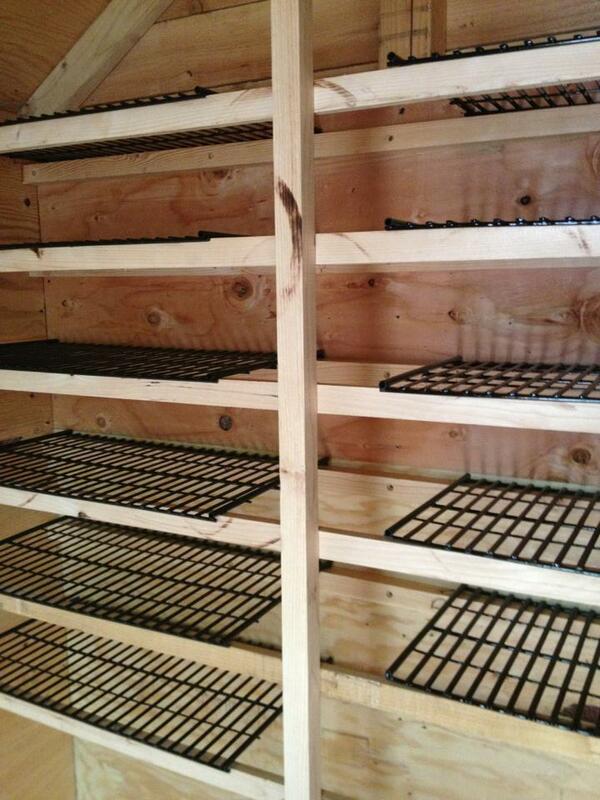 This will allow the smoke to work its way into the wood and season the racks that we spray with Pam cooking spray. We had a goal to finish the smoke house before the annual dip net fishing season here in Alaska. Up here each family can take a number of salmon for personal use during dip net season. The head of household is allowed 25 fish and each family member is allowed 10. In our case 55 fish. We are heading to Kasilof next weekend to try and get our limit. When we return we will prepare and smoke the fish in our new smoke house! The smoke house has the ability to both cold smoke and hot smoke a variety of meats. Everything from moose, beef, pork, chickens and turkeys, fish, cheese, eggs and more. Each type of meat will require a different length of time in the smoker at different temperatures and different pellets. A smoke house is not designed to be used like your grill or even the small commercial smokers found in many stores. For example a turkey may take 20 hours or more. It will be fun to try different things and techniques in our new smoke house. I’ll be sure to share them here with you. A huge thanks has to go to Marvin for his help and expertise in the design and the hours that he put in with us to make this project a reality. A big thank you to Tyler as well. Do you have any questions on the design? Or do you have ideas to share? We would love to hear them. UPDATE October 2017. 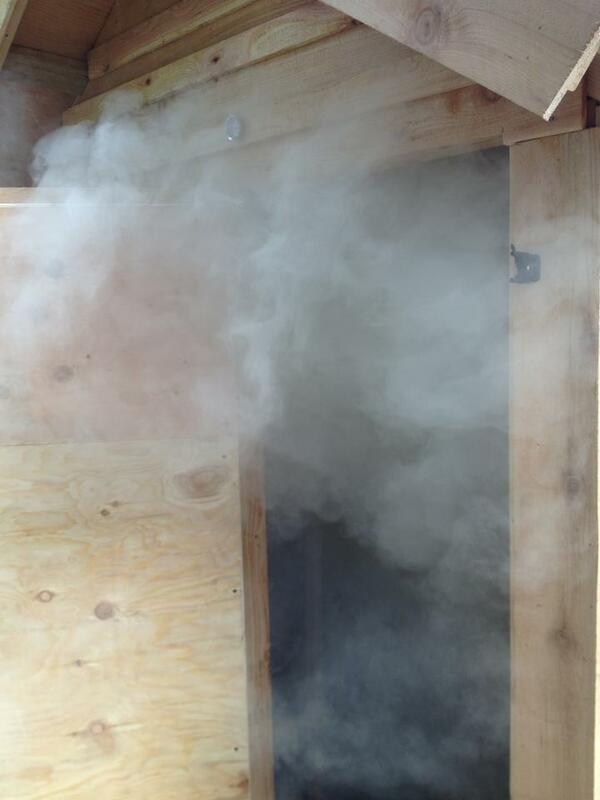 There have been a lot of questions about our walk-in smokehouse since it was posted on another site on the web. I will do my best to answer them here in this update. Question: After smoke curing of my meats, how long can I keep it, or do I need to consume it right away? Forto: You can leave the finished products in the refrigerator for about two weeks. For a longer period you will want to freeze it. 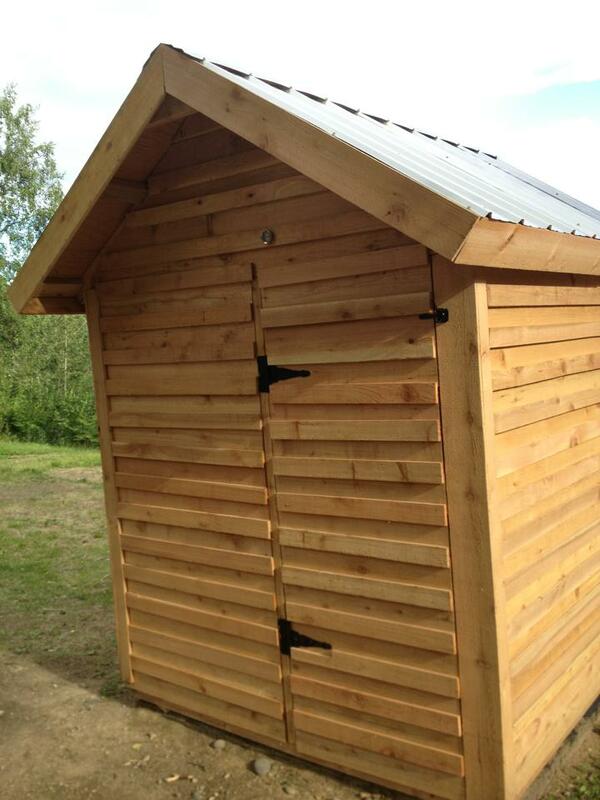 Question: Do you have plans for the smokehouse that you can share? Forto: No. This is by far the most asked question about our smokehouse. Our good friend, Marvin “PeeWee” Rankin and my son and I built it from scratch over a couple weekends based similarly on what he had build for his own smokehouse. It is a pretty simple design. It is about six feet square with an 8 foot peak roof. 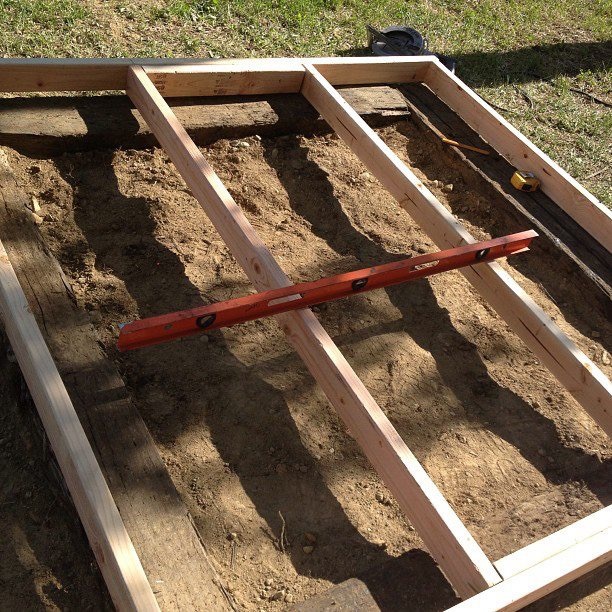 The foundation is railroad ties and the framing is simple 2/4 framing 16 inches on center. 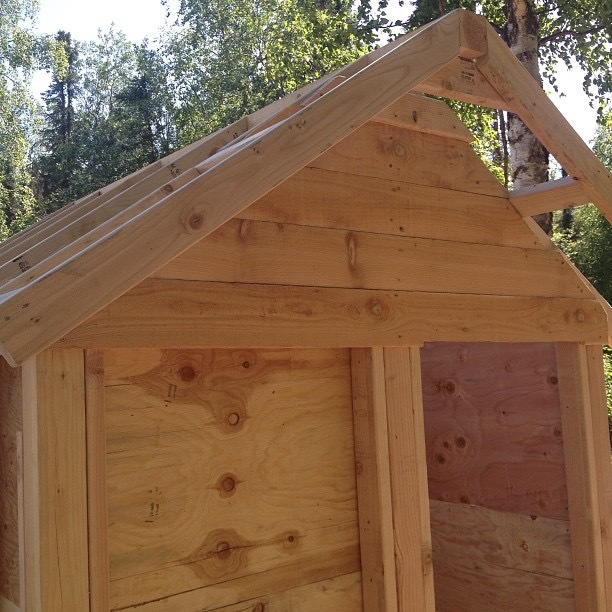 It is sheeted with plywood on the inside and cedar outside using fence pickets that you find at Home Depot or Lowe’s. The roof rafters are left open and we use dowels to hang hams from the ceiling. 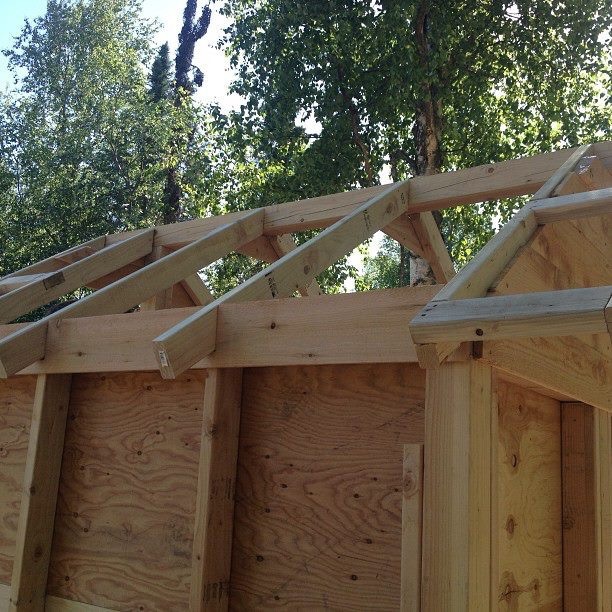 The smokehouse is not vented intentionally by smoke does escape from the roof as intended. We used plywood on the floor over 2×6 floorboards and 2x2s to build the rack system. 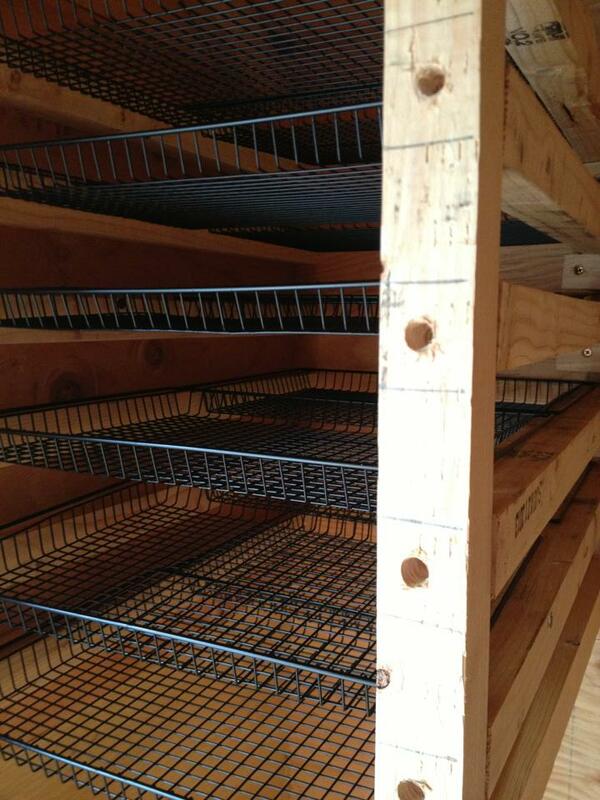 The racks are rectangular in shape and were special order from a supply company back east. We also have a rack system that is used in smaller metal-type smokers that we use for jerky and white fish. Our friend, PeeWee passed away a couple years after we build our smokehouse and we have honored him with a small plaque above the door. Now each time we use our smokehouse we pay a bit of gratitude to our dear friend. Question: What do you use the smokehouse for primarily? 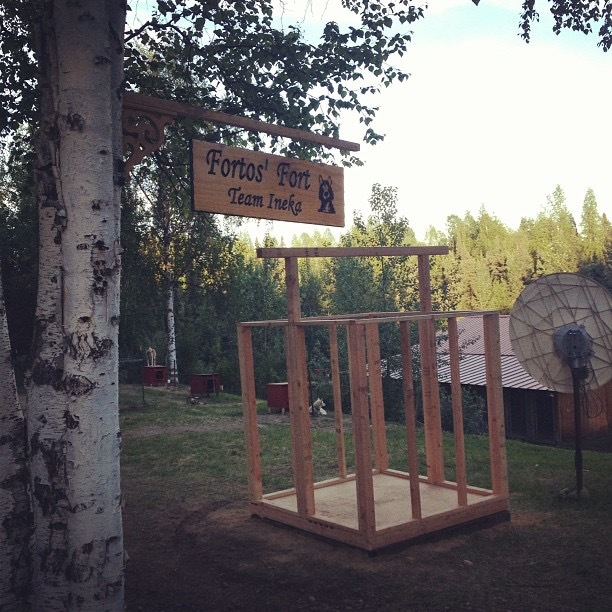 Forto: We use the smokehouse mainly for fish that we catch dip netting every July here in Alaska. Almost always it is Sockeye (Red) Salmon from the Kasilof River. Each resident in Alaska is allowed to use a dip net and catch 25 fish for head of household and 10 for each additional family member. Over the last few years we have smoked briskets, chicken wings, turkeys, chickens, ribs, other fish like halibut and rock fish, and even a 1/4 pig. Question: Can you share your recipe for your smoked salmon? Question: Can you share a recipe for smoked chicken? I would like to know how to build a smoke house. Could you give me the directions? 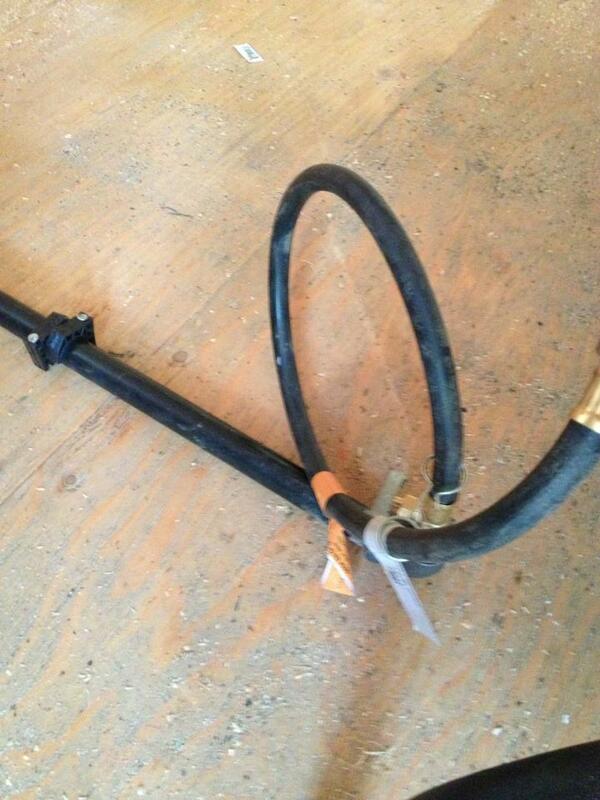 What BTU burner are you using? 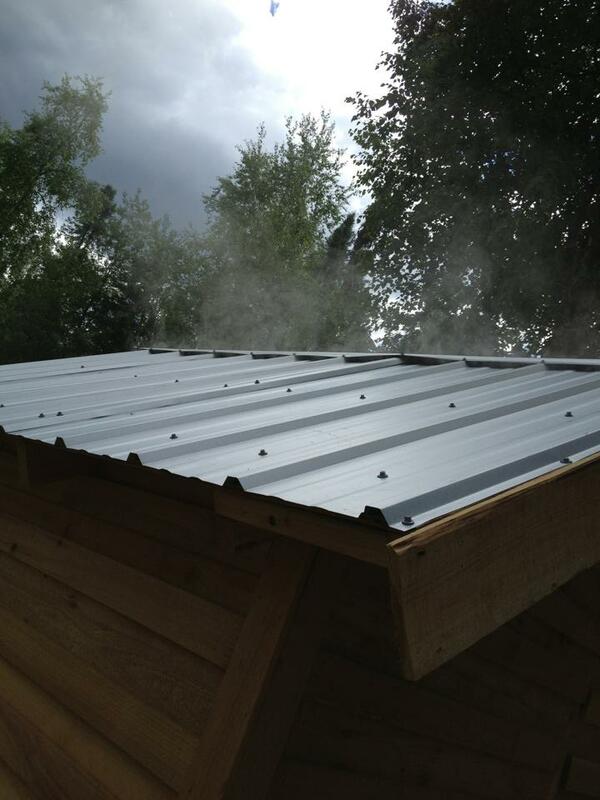 What temperature can it get the smokehouse up to? I am building the same size smokehouse as you and need the burner to be able to hear it up to 180 degrees.